Last week, ABC News’ Jon Karl reported on emails that he said he’d obtained, that purported to show the process involved in developing the talking points on the September 11 attacks in Benghazi, Libya. Once CNN’s Jake Tapper actually did obtain a real email, and the White House subsequently released the actual email chain, Karl’s “emails” were revealed to be summaries, provided by a source, which contained invented quotes and significant omissions. 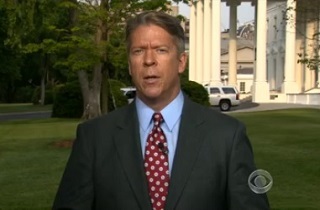 On Thursday night’s CBS Evening News, Chief White House Correspondent Major Garrett reported that a Republican source was behind the invented quotes, which were also leaked to CBS News’ Sharyl Attkisson, a fact that Karl did not disclose in his original report, or his followup, and which Attkisson did not disclose, either. ABC News has, thus far, defended Karl’s reporting as “consistent with” the actual emails, and has not addressed the attribution issue, except to say that “”Karl’s report could have been even clearer” that the reporting was not based on the actual emails. This analysis by Major Garrett, as respected and objective a journalist as there is, contradicts that notion. Author’s Note: This post has been updated to reflect CBS News’ Sharyl Attkisson’s reporting on Republican-leaked email summaries, and comment from ABC News’ Jeff Schneider.